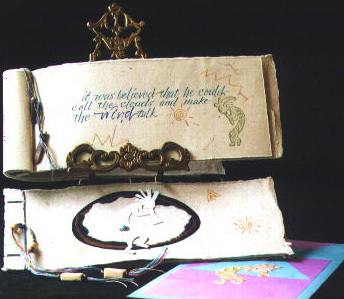 Kokopelli book. Fabriano paper for the text, with assorted other handmade papers included in the binding. Pen and brush lettering with gouache and Pearlescent acrylic, and markers. Kokopelli rubberstamps were utilized for artwork. Computerized text features the Bradley Hand ITC font. Cover is handmade paper with copper embossing, a stab binding with decorative bone beads, and features a hand cut, collaged Kokopelli figure with beaded details. Slipcase constructed from a blue #10 envelope with paper details and a Kokopelli figure cut from original paste paper.